When we very first went to look at what is now our property, we climbed out of the car and fell in love with the view. But a view is not the be all and end all of these things, and so we did the very adult thing of touring the place, and promptly fell in love with the expansive food gardens already in place, complete with irrigation, surrounded by a small orchard. As Mr Barefoot said at that viewing, if we couldn’t be self-sufficient here, we never would be. With four small-but-rapidly-growing mouths to feed, there was an immense appeal in being able to offset our grocery bill with our own home-grown, organic fruit and vegetables. Over winter, not much got done beyond weeding and mulching. As spring grew near, we started propagating seeds in the hothouse, and over the last couple of weekends, we’ve started planting out and filling the garden beds. As the days get longer, we also enjoying being able to head out before dinner and do a bit of work, pulling weeds, checking growth, ensuring the roos and goats and rabbits haven’t been having a lovely old feast at our expense. It’s a great start, and we love checking in on our little plants of an evening. The second bed is currently being weeded and mulched for planting out once the first bed is full, and will contain things like tomatos, more potatoes, chilli, lettuce, watermelon and rockmelon. 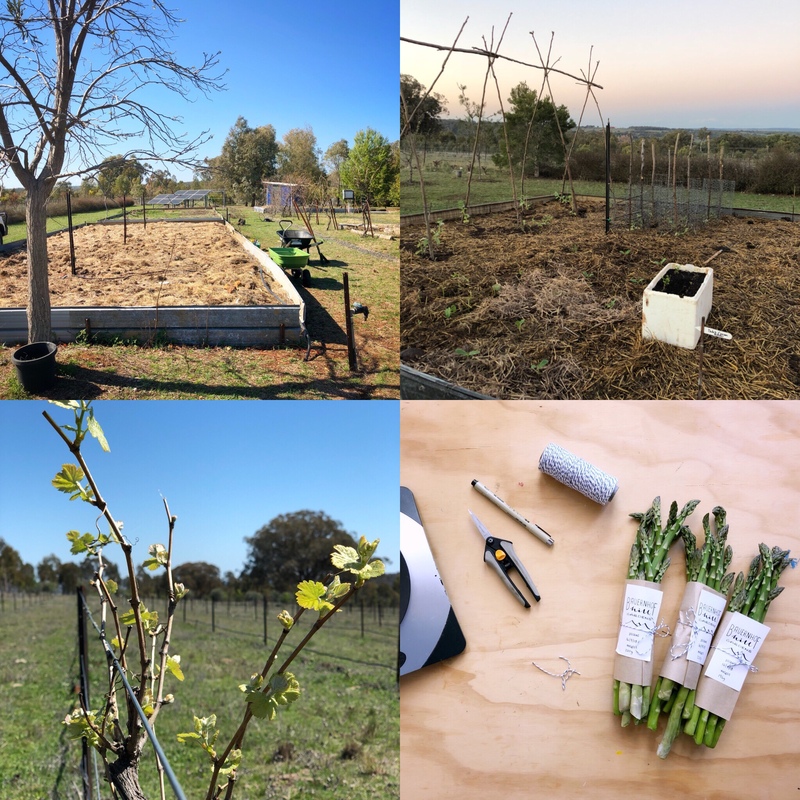 This weekend I am looking towards some bigger planting, with more grapes waiting for attention, and also quite the pile of olive saplings ready to go out as well. All of our beds are now on automatic timers for watering, which makes ongoing maintenance a lot easier, and we can focus on continuing plantings, minor weeding, and, hopefully sooner rather than later, a lovely, rolling harvest of super yummy, farm fresh veggies to fill our plates with.